A South California town is positioning itself to be a mecca of cannabis cultivation in the coming years. The vision is complete with “bud and breakfast” resorts and “soak and toke” mineral spas. In Desert Hot Springs, property developers are planning cannabis cultivation and distribution businesses that will serve as a prime location for the budding recreational marijuana industry. Leaders see the sites open for business by 2018. For example, one property developer is planning to be Southern California’s first stand-alone cannabis extraction facility in an old welding shop that used to be a barn. Other property owners are planning greenhouses that will span tens of thousands of square feet and destinations for locals and tourists alike. With the passage of Proposition 64, California voters opened the door to what will soon be the single largest legal marijuana market in the country. Desert Hot Springs is one of those that is preparing to capitalize on that prospect. Characterized as a “bedroom community,” Desert Hot Springs is located in Coachella Valley and has a population of 26,000. It was the first community in Southern California to green light large-scale growth of marijuana. Currently, there are two dozen new marijuana businesses, and the hope is many more will be added over the next two years. 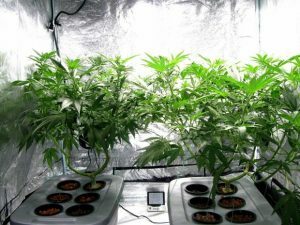 The town council reportedly derived its inspiration from the successes seen in both Colorado and Washington after those states legalized recreational marijuana in 2012 – the first in the nation to do so. Both states have now benefited from tens of millions of dollars annually in additional tax revenues. Further creating an incentive was the fact that Desert Hot Springs had declared a fiscal emergency following the Great Recession. Wading into the marijuana industry seemed like it could be a feasible solution, according to Independent.co.uk. The mayor wasn’t on board immediately, having actually argued for a moratorium on opening new marijuana businesses when he first took over the post in 2007. He says at the time, he was a “plain No” when it came to marijuana legalization. But his ideology shifted, he said, when his mother and later a close friend were diagnosed with terminal cancer. In the last few months of his mother’s life, he said marijuana was the only substance that relieved her pain. It opened his eyes, he said, and he began holding meetings in the marijuana industry. These weren’t “stoner hippies.” They were doctors, lawyers, investors, dedicated parents and ethical business owners. It changed his viewpoint of what the industry is and how it could help people. From that point forward, his position was a complete 180-degree flip. One of the property developers in Desert Hot Springs says he too was reticent when it came to entering the cannabis fray. However, he spoke at length with a marijuana business lawyer who explained to him that marijuana cultivation could be done legally. It’s projected that growth in recreational and medical cannabis sales will near $25 billion by 2020, according to ArcView Market Research. Of course, this assumes that the new presidential administration doesn’t crack down on businesses that abide by state-level laws, but may still run afoul of the arcane – but still in effect – federal marijuana statutes.